I found this on Netflix one day and, despite the fact that it had a 2.7 star rating, put it in my instant viewing queue. Besides, it has 4 stars on Amazon and a 7.5/10 on IMDB, and anything in that ballpark is usually pretty good, sometimes even great, so I took the risk. It just depends on how unorthodox the film is, how far it strays from lowest common denominator. Today, I finally watched the movie. Despite my reservations about the voiceover (as it does get repetitive), I liked it overall. So Netflix’s rating, in this case, was mostly wrong. 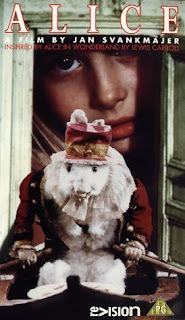 Alice is a surrealist retelling of the classic postmodern story about a little girl named Alice who finds herself in a strange place called Wonderland, where she has wonderful and sometimes scary adventures with eccentric characters, most of them animalistic. In this version, I don’t recall actually hearing the word “Wonderland,” but there are references to Mary Ann, if that sways any of you purists out there. Two of the most interesting and original aspects of this movie are the use of stop-motion video to capture the Wonderland creatures/characters and the way each character is (and many random objects are) reflected in the real world. The rabbit is actually Alice’s own stuffed rabbit. The caterpillar is a sock with eyes in this version of Wonderland, and if I looked hard enough, I’m sure I’d notice a sock lying around somewhere in the real-world shots. And the list goes on. At times, this movie is beautiful. At times, it is quite disgusting, and that quality comes from both the visuals and the sound effects. For instance, when the rabbit starts eating his own stuffing (sawdust), the crunch is so vivid, and the visuals are so startlingly in-your-face, that it makes me kind of uncomfortable, almost sick. While I thought the voice for the English dub was going to be annoying (and yes, the close-ups of Alice’s mouth are annoying), instead, I found that the girl who voices the narrator/Alice does a fantastic job of mirroring the sound effects and reflecting the sometimes disturbing visuals of each scene. The final shot is one of my favorites, as we get one last look at Alice’s room in the real world and – well, I won’t spoil any more than I already have, but I recommend this film if you love the Alice story and its adaptations, especially if you were disappointed in Burton’s latest one, or even if you weren’t. At the very least, this Alice is something new to try. Except, at 22 years old, it’s actually almost as old as I am.